Discussion in 'Article Discussion' started by Tim S, 14 Dec 2008.
spenc259 in the build stage!!! Not a bad looking keyboard. However when my Gen1 G15 dies I will be getting a Logitech Illuminated Keyboard. The bending is a dealbreaker for me. It otherwise looks really good, and the thinness would be useful for my next build. The double height Enter is particularly useful if you've got a mutant growth on your right pinky. The non-standard layout is a deal breaker for me, only exception is for a HTPC wireless keyboard. I bought Apple alu-keyboard at spring, and i think its the best keyboard i've ever had. It's a tad expensive (atleast in here Finland), but it is definately worth the price. I have the Logitech Illuminated. It also have the problem of bending in the middle. It's not something you'll ever notice while typing, though. It looks damn good to make up for it. Only drawback is that they have combined the F-buttons and the media keys. (They have an "fn-key" to switch between the two.) Not that I use the f-keys that much, but it would be nice to have both anyway. The media keys doesn't work 100% with Winamp either. That's a software bug, though. I bought Apple alu-keyboard at spring, and i think its the best keyboard i've ever had. The layout of the first one is virtually identical to my cheap Microsoft keyboard, except the space bar is enlarged on the ms one. For less than a tenner the ms is actually excellent. A nice attempt and nice boards for the price but I think I'll stick with my Ikari SteelSeries G7. I resent that the lcd features on my g15 'rarely' see use! I use all of the extra functions daily, the lcd screen shows me whos in teamspeak, joins disconnects and who's talking, it shows me fps in graph form(not very exciting! ), and processor heat which atm is a clincher as it seems to be overheating regularly. The 'G' (macro) keys are bound to moving around teamspeak channels, changing volume in teamspeak and jumping to favourite channels. About this bend... Will I find myself bending the keyboard every time I type a sentence? Is it the sort of bend that once you realise it is there you keep pressing the "G" key (its pretty central) to make the keyboard bend, kind of like when you realise there is a bit of thread hanging off a piece of clothing and you don't stop tugging at it until you have unravelled the whole thing...? is it backlit? 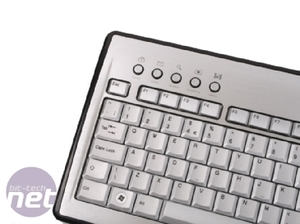 I'd like a nice thin simple keyboard that is backlit, but they seem to be hard to find.